This short post is inspired by Koji Oe and Aorii’s conversations about the term ‘anime’ and ‘cartoon’. I was going to write my response and realized that it would be too long. In this post I will talk about my perspective on anime, cartoon and about how deep they can be. Anime is a cartoon…or more precisely, it is a subgroup of cartoon. While there is nothing wrong about calling anime (or Japanese animation) a cartoon, doing so can be inconvenient because cartoon includes almost everything that is animated. People won’t know who exactly you are addressing. I think the term anime is a necessity. It helps me distinguish myself from the fans of other animated media and helps depicting the specific group of people who also enjoys Japanese animation. I’m not going to go into details about how anime is different from other animated works because I’ll be repeating what we already know. 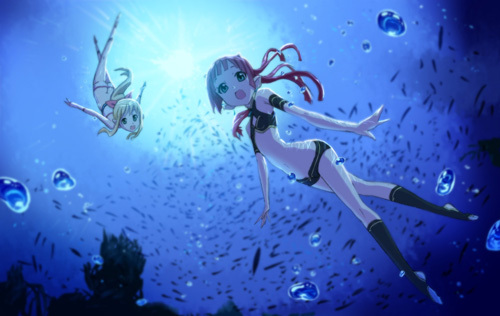 Anime is like the ocean. It can be pretty deep. I have heard lots of people said that anime or cartoon, to be exact, is nothing deep. Well, deep things will not jump right at you (because they are buried deep within, LOL). So, unlike the entertainment that you can easily feel, you have to purposefully think and look for the meaning, the inspiration, the message or the sarcasm hidden inside. Anime, like every other media, varies a lot. They range from totally shallow to immeasurably deep. 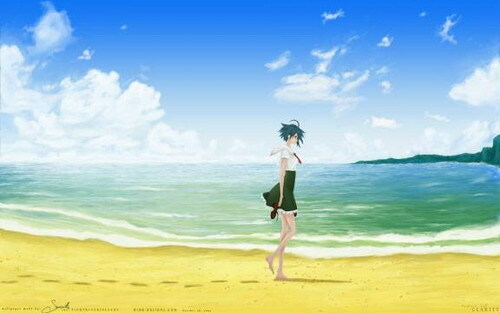 They are like the ocean; if you walk along the beach, you will only feel the beautiful scenery and the refreshing breeze. But if you want to catch some big fish, you have to try harder and hire a boat to take you to the deeper water. This principle can be applied to every media out there, no matter how shallow looking they are. Do I feel like I, as an anime fan, am better than others? No. But anime surely makes me a better and happier person in so many ways. Cheers! This entry was posted in Articles, Talks and tagged anime, cartoon. Bookmark the permalink. Nah it’s not the use of ‘cartoons’ that annoyed me — I can admit that anime is western cartoons attached with a sense of Japanese cultural identity/superiority. It’s the fact he refuses to think outside the box, attacks me on my own blog, and then comes back to call the kettle black. I didn’t feel like going to his blog to continue arguing. Too tiring. LOL, arguing too much can be bad for health. Ya…arguing is a pain and should only be done when necessary. A shame when people don’t realize that cartoons (like say… Hysteria or Animaniacs) can also be pretty deep. I’ve been surprised quite a few times when I rewatch old episodes of Animaniacs and saw how clever and witty some of the jokes are. in my mind, when people said cartoons, I immediately recognized them as western animation. It is only when people said anime that I knew they are talking about my kind of animation. I just think Anime is superior than that of its western brother, is all. As am I. Older American cartoons have a better reputation in my mind than current offerings (Pirates of Darkwater comes to mind), but in general I would rather watch anime than western cartoons. The stories are simply better. People say to me, ah stop watching cartoons, which that really annoys me because the level in anime is way higher and more mature than cartoon. Most Western i think, thinks that anime is the same as there cartoons… *sigh but i admit that not all cartoons are bad, but you simply cant state a realtion between them. It’s because we are all deep into the media together that we understand that. For other media, we may fall into the same trap and simply generalize them or just look down on them without really getting to know them well. Canne, I totally agree with you that anime is sort of like an ocean. Their are many series out there that can make you think of certain aspects of your life and think about a simpler time or open your mind to new ideas. I guess you could say that whenever I watch a particular series, I try to pay close attention to what the series is trying to convey. Thus I can appreciate it and also reflect on it at the same time. Anime is an art comparing to normal cartoons. While Anime can be deep, cartoons have obvious morals and lectures in them. I hate calling Anime a cartoon, I’d rather say Japanese Animation or The-Best-Thing-Japan-Ever-Made… But meh, better to say Japanese cartoon than CHINESE cartoon, which is common misunderstanding in my country. Shesh! Of course! I remember your avatar but there’s no link in the new name amymore. BTW, congratz on new blog address! I’ll fix the blogroll then. Oh! Right, I haven’t noticed. Thanks, finally done with that mb2shan adress, was damn random looking. Right, worldly different – they’re just entirely different mediums, with entirely different cultural backing. In all too many a ‘cartoons vs. anime’ arguments have I been, that I now just shrug them off because I’m too tired of em. Then again, people do need to remember there are western animated series directed at older audiences. zzeroparticle puts it well; you also reminded me of Cybersix, which was just about the most sexually confusing cartoon of my childhood, so I can only assume I wasn’t among its targeted audience. But yes, it’s only with anime that I feel so enthralled by some series awesome creativity. It’s that special charm it has. Not fully about anime, but I do enjoy when cartoons (which are usually written/created by adults anyway) contain so many implications that only other adults would understand… it might seem like “kiddy” but most of the time, anyone can find something real in cartoons … anime is no different. Agreed. Anime is indeed a subset of cartoons, which basically encompass all forms of animation. A lot of people have this strict hierarchy set in their mind that anime has a lot of depth while Western cartoons don’t, but that’s really not true. It’s true the other way too. All mediums have depth and all mediums have filler crap. That’s what I like to think too. Also the fact that I enjoy MANY different series/genres makes me happier too. Being so open minded and accepting of so many different series makes me a lousy critic in reviews but…I don’t mind. I like keeping an open mind when selecting which anime+manga to experience, I can always find an anime series to suit my mood for that moment.